“I’m selling my 1970’s vintage analog string/polyphonic synthesizer – the ARP OMNI II. If you are familiar with The Cars “Good Times Roll” or Joy Division “Love Will Tear Us Apart” you know the legendary sounds the OMNI II is capable of. This unit was fully serviced and electronically restored by Synth Chaser in San Diego, CA. Nathan is one of America’s foremost experts on ARP OMNI repair (as well as other vintage synths) – and posts videos of his repair and restoration work (including this one) on Youtube. Besides all the work done to bring this synth back to original ARP 100% glory I also had the optional 4075 filter upgrade done, as well as the SynthChaser Orange LED slider kit installed. Very helpful seeing all the slider settings onstage, having the sliders move easily. Plus having light-up LEDs that match the ARP color scheme looks cool. As you can imagine, this unit sounds amazing – haunting and period correct. All polarized capacitors recapped – 106 caps total. SynthChaser Orange LED precision slider kit upgrade. Key bed refurbished: buss bar cleaned, key contacts adjusted, key bed leveled, bushing kit installed. Switch board troubleshooting and repair. XLR jacks replaced. All LED’s replaced to provide uniform brightness. Keys removed, cleaned and leveled. Synthesizer calibrated to factory specification. “ARP OMNI II Analog Synthesizer. Internal power supply not working, may need transformer or replacement power supply + ?. 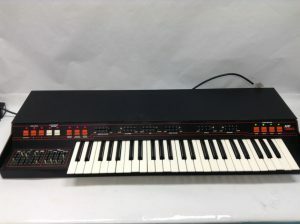 “Up for bids is an ARP Omni 2 Synthesizer. It was manufactured between 1978-1981. It is in Excellent operational and Great cosmetic condition. It was used in a professional smoke free studio. This is a non-working Arp Omni Mark 2! It is complete as far as parts, keys, components, etc. are concerned, and is only missing the pot slider caps. This unit doesn’t play a note! It is purely a “fixer upper” or useful for parts. It does power on, and all lighted switches turn off and on… but the most it does right now is produce the infamous electrical clicking noise (through the “SYNTH,” “STRINGS,” and “BASS” outputs) when keys are pressed, followed by a faint click noise when those keys are released. Physically, it is in decent shape for its age, with the expected scratches and dings here and there from transport; the control panel, sliders, buttons, and keys are all good; no keys are chipped, and they are fairly even across except for two or three [See pictures.]. The blue balloon tantalum key capacitors were all replaced several years ago with electrolytics. The power supply tantalum and electrolytic capacitors were replaced with new electrolytics as well. The phaser circuit board and other electronics are all present. Arp Omnis are great synths: they offer a nice set of analog string sounds, a basic synth with simple, changeable parameters, and a bass section as well. All of these can be combined, too. Plus, there are two on-board effects: a phaser and a “wave enhancement” feature, too, which does _____ that makes things sound real cool…. Finally, the Omni is polyphonic through divide down circuitry (except for the bass section when it is activated; I think that is low note priority monophonic if I recall correctly). 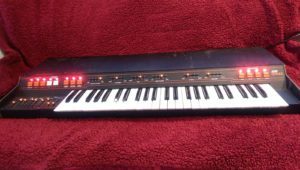 ” This is a used, working ARP Omni-2 in good condition. I purchased this from its original owner several years ago. When I purchased the keyboard, it was not working, so I paid a technician to recap and fix the unit. It is now working, and is a great vintage keyboard for the recording studio, particularly for the fake string sounds and the surprisingly versatile synth feature. I love this keyboard, but I’m also downsizing my studio and this is one of the keyboards that I’ve decided that will go. If you press down the lowest C key on the keyboard, the connection sounds intermittent…until the keyboard has been on for about an hour or so. I suspect there’s a capacitor somewhere in the path of this key that is causing this problem, but I don’t know enough about electronics to fix it myself. Suffice to say, if you leave the keyboard on for about an hour, this problem tends to disappear and the key plays fine. Or you can just choose to ignore the lowest key on the keyboard, as I have for the past several years. The lowest Eb key has a mechanical “clickety clack” sound when you release the key. This does not affect the sound coming out of the synth. It’s purely a mechanical quirk in the keyboard mechanism itself that sounds like one of those old noisy IBM PC computer keyboards. None of the other keys demonstrate that mechanical clickety clack sound upon releasing a key. The signal to noise ratio is much better if you use the individual Strings/Synth/Bass audio outputs instead of the main output. In fact, I recommend not using the main output at all. Besides fixing and recapping the instrument, the technician also replaced the slider end pieces (not the slider pots themselves), as many of the end pieces had become brittle and broke off. Some of the original slider end pieces are included in a plastic bag. All of the sliders work, though they have a slightly sticky feel. From what I’ve read, that is possibly how they’ve always been, even when the keyboard was new. There are some cosmetic scratches on the case. All of the buttons and their associated LEDs work. A power cable is included. “Up for auction is an ARP Omni II synthesizer in excellent condition. 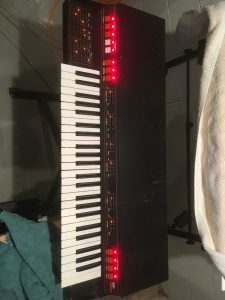 “ARP Omni II for repair or parts . I cannot get any sound from this unit but I may not have it hooked up correctly . It does power up and indicator lights do light up though . Have a look at the pictures for condition details . “Vintage ARP Omni 2 Synthesizer. This unit is being sold “AS IS” for parts. Please view all pictures up close. 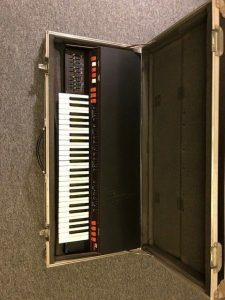 “So here is a beautiful condition cosmetically Arp Omni 2 from Hannett’s personal synth cache and in particular his collection of Omni 2s found in the Hannett cache during the making of the documentary on him. It is in a full flight case and a lot of the keyboard and button functions work but it could do with a service. “Here we have vintage mid 1970’s Arp Omni 2 String Bass Synthesizer. The unit is in need of service as many Omni synths are at this point. The board powers up, all lights work but the cello button. The Omni does not pass an audio signal. Some scratching to the paint on top. Probably from another keyboard laying on top. This unit is for parts or repair. It powers up, but no sound comes out of any outputs. I bought this unit from an Arp collector who had several units of almost every synth Arp created. He didn’t have time to repair it and I bought it with the intention of repairing it myself, but I just don’t have the time at this point. This unit has been partially repaired, as it looks like all of the tantalum capacitors have been replaced, which is one of the more labor intensive jobs when it comes to repairing this synth. Aside from that, I do not know what else has been done or what is wrong. It does have some extra jacks on the rear, though they don’t appear to be connected to anything. It looks like at some point, someone was going to add some modifications to it, but I have no idea what. There are also two switches on the front panel, under LFO Speed and Mix. Not sure what they are doing. They should be pretty easy to just remove and return this to stock unit while repairing. “Up for sale is a beautiful ARP Omni Mk 2 in excellent 9/10 condition.